This article deals with the basics of marquee event planning with a step by step guide to arrange elements of your forthcoming event in a logical order and prioritising services which may need to be booked first. Event planning takes a degree of dedication and there is no point doing table plans or choosing place settings until much nearer the event. 1: Firstly you need to decide your aim and objectives of the event you intend to hold. If it's a wedding, then the answer is quite straight forward. A corporate hospitality event needs to have an objective. Determine your objectives and make a list of who you going to invite. Decide on a date and check with important or essential guests that they will be able to attend. If the marquee is not being sited at you home or work, then you will need to source a venue. It is good idea to make a budget at this stage of the planning; although in common with most major projects the final cost of your event will probably be double what you have budgeted for. 2: Arrange the tent, the venue and the caterer at more or less the same time. 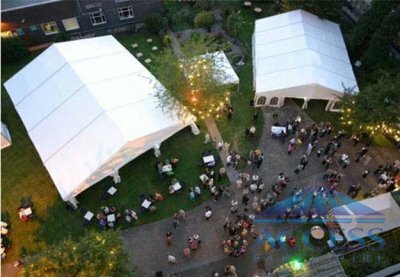 The marquee company and the outside caterer are the two most important contractors and the tent company will also need to understand the requirements of the caterer. Popular or specialist tent hire companies will take bookings and be planning an event as early as a year in advance for busy weekends. for larger outdoor events and may otherwise get overlooked or booked up if left to the last moment). 4: Entertainment, audio visual equipment, furniture hire, theme decor and a photographer are all next on your planning hit list. her up your list of event planning priorities.